Plus, the likelihood of a Switch version and Xbox One collections. Following the announcement of a 2018 release window and Toy Story world, IGN (2) and Game Informer (2) sat down with Kingdom Hearts III director Tetsuya Nomura at D23 Expo 2017, who discussed various new details about the game. Kingdom Hearts III will feature a party system that allows for more than two additional members to fight alongside Sora. This, in part, comes from the decision to get rid of the “Dimension Link” feature from the PSP game Kingdom Hearts: Birth By Sleep. Nomura also hinted at the Gummi Ship offering new or improved elements. Nomura has longed for Toy Story to appear in the Kingdom Hearts series since the release of Kingdom Hearts II. Rather than follow the story of the original film, Pixar made a special request for the Toy Story in Kingdom Hearts III. Nomura his team considered all of the films in the series and made a decision about where to place it. “We placed the narrative in Kingdom Hearts some place after Toy Story 2.” He said he worked very closely with Pixar to get its approval on the new story for the game. “So many rounds of review! I couldn’t believe how many back and forths I had,” he laughed. 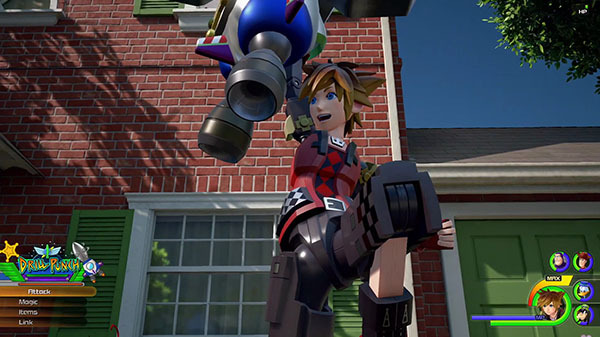 The trailer shows Sora, Donald, and Goofy team up with Woody and Buzz to search a new area called Galaxy Toys. The story of the Toy Story world involves searching for Andy, who has gone missing, as well as figuring out why Organization XIII has appeared in that world.